IntrThere’s no denying that getting a massage after a long day at work has a beneficial effect on our physical and mental health. But getting a massage after spending a day at work is often complicated. You can either ask for a massage to one of the members of your household, or you can make regular visits to a professional masseuse or masseur. The problem with asking one of your household members for a massage is that they’re often not disposed to offer one, and that’s easy to understand. Just like you, they spend their whole day doing something else, so instead of massaging you, they would prefer to get a massage themselves. Now, if you’re willing to go to a professional masseur, you should know what you’re getting yourself into. Sure, these professionals are capable of providing a very thorough and relaxing massage, but their skills come at a price. You can’t find a cheap massage professional, there’s no such thing. Luckily, this is where technology comes in handy. In the recent years, technological advancements allowed us to create more effective automated massagers. Sure, using them might not provide the same experience as a professional massage would, but the best models come really close to doing so. And the best part is, most of them come at an affordable price. In fact, you might even save a lot of money by buying a massager instead of going to a professional in the long run. Now, without further ado, let’s take a look at what you should know about self-massage tools. The first thing you should know about self-massage tools is that they come in many shapes, sizes, and price ranges. Just because a massager is smaller or cheaper than another doesn’t necessarily mean it’s less effective, it just means it’s designed with another purpose in mind. Now, let’s take a quick look at the different types of massager’s you’ll find on our website, and how each of them can benefit you. Massage chairs are by far the best self-massage tools. These units might be large, but they will provide a very comfortable and versatile massage. One of the advantages of using a massage chair is that they offer a complete massage experience. These units use predefined or customizable massage programs to massage all your body, starting from your neck and finishing with your toes. Not only will these massages prove very relaxing and enjoyable, but they will also stimulate your blood circulation and relieve your muscles from the tension they accumulate during the day. When you’re done, read our most effective back pain relief products round-up. 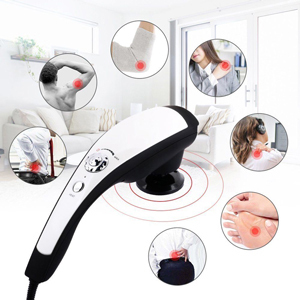 Another advantage of using this type of massagers is that they provide massage experience that cannot be replicated by any other machine, and not even by massage professionals. One of the unique experience these models can provide is the zero gravity massage. To start this type of massage, the massage chair will tilt backward, reclining your body towards the ceiling. Once your body is fully reclined, the massage chair will align your head with your feet, so most of your body weight will be supported by the chair, not by your bones and muscles. Getting a massage in this position is an amazing experience, and it will relieve your muscles like nothing you’ve ever experienced before. Make sure you’ve gathered all the facts with our most comfortable recliner reviews! Overall, these are the best massage tools available on the market today, and they’re well worth their price, even though they’re not cheap. Massage cushions are the economic version of the massage chair. Unlike the massage chair that stands on its own, the massage cushions can be put on chairs, armchairs, or sofas, so they’ll take up less space. One of the advantages of using these self-massage tools is that they’re very versatile. Thanks to the fact that they can be placed on a chair or sofa in order to work, you can take them with you at work, and you can even use them in a car or an RV. Another advantage of using massage cushions is that they provide a very thorough massage. Most of these units are capable of massaging most of your body, starting with your neck, and continuing with your back, hips, buttocks, and thighs. This type of massage is not only very relaxing, but it’s very effective at removing any muscle knots you might have in your muscles. 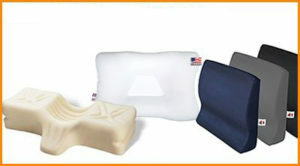 All in all, massage cushions are valuable products, and they offer really enjoyable massages. Most of them come with a heated massage feature which will only enhance your massage sessions. Neck and shoulder massagers are specially designed to target these parts of your body, and they have a specific design, very similar to the neck rests you find in airplanes, only larger. This type of massagers uses a variable number of massage rollers to massage your neck and shoulder muscles. Most of them use a heated massage feature that will improve your massage experience and provide a very relaxing experience. Here’s what to look for if you want to buy the best heating pad possible. For an increased stability, neck and shoulder massagers come with hand straps. The straps can either be held or in some cases, you can put your arm through them and carry on with your usual activities. One of the advantages of using neck and shoulder massagers is that they’re portable. Most of them use rechargeable batteries for power, so you will be able to move around the house while your muscles are getting a massage. And despite their name, these self-massage tools can be used on different parts of your body, as well. Some models can even be used for foot massages, so you might say they’re very versatile. Overall, neck and shoulder massagers are great for what they’re meant to do. They relax the muscles in your neck, shoulders, and upper back, and they provide comfortable massages. Handheld massagers are some of the most portable self-massage tools available on the market today. These units are small, and most of them will fit in a normal backpack or a large purse. Thanks to their small and compact designs, handheld massagers should be your go-to massage tools if you plan on getting a massager you can use while you’re away from home. One of the advantages of using this type of massagers is that they’re very versatile. Since you can hold them in your hand, you can point the handheld massagers everywhere you want, or everywhere you feel your muscles tense. Another advantage of using this type of massagers is that they come with changeable massage heads. Each massage head is specially designed to accomplish a specific task. Some of them are very good at activating your muscles, others are specially designed to stimulate your blood circulation, and some might even give your skin a nice scrub. Thanks to the multiple massage heads they use, the handheld massagers provide a lot of benefits for their users. The bottom line is, the handheld massagers are perfect for people who want to use a self-massage tool while they’re away from home or while they’re engaged in another activity. These units are small, portable, and versatile, and most of them come at a good price. Scalp massagers provide a very comfortable and relaxing massage experience. After a long day at work, you can simply lounge on a sofa and have a unit massage your head and scalp muscles while you’re enjoying your favorite series. But scalp massagers do more than just massage your head and scalp muscles. These units stimulate your scalp blood circulation, so they stimulate hair growth and limit the amount of hair you lose. When the muscles in your scalp are stimulated, more blood reaches the blood vessels leading to the muscles. The increased blood flow will bring more oxygen and nutrients to your scalp, and that will be beneficial for your hair follicles as well. Thanks to the increased amounts of food and oxygen they receive, your hair follicles will be stimulated to grow hair, and they will maintain your hair better, so you’ll lose less than you did before you start using the scalp massager. All in all, scalp massagers provide a great massage experience, and they are perfect for people who want to stimulate their hair growth. TENS units are medical devices that are specially designed to improve your muscles’ elasticity and flexibility. Constantly using a TENS unit will restore your muscle tone, and it will speed up your recovery after a muscle injury. But TENS units can also reduce the amount of pain you feel. These machines produce a small electrical current that enters your body through the sticky electrode pads. This electrical current will competitively occupy the same receptors as the pain signals, so your brain will not be aware of all the pain you feel. In this way, the TENS units will decrease the amount of pain you feel after an injury, or even the pain caused by chronic diseases. One of the advantages of using this type of self-massage tools is that they’re portable. Most of these units are not larger than your smartphone, and they have long lead cables that will allow you to connect the electrode pads to your body even when you’re moving. And the great thing is, the TENS units can also provide a relaxing massage experience. You can select different intensity settings to adjust the units’ power to your mood and needs. Overall, TENS units are effective self-massage tools that are great for people who suffer from acute or chronic pain. A few things can be more relaxing than soaking your feet in a foot spa after spending a long day at work. These units use simple yet effective massage techniques to offer a comfortable and relaxing experience. Simply put, foot spas are water basins in which you can soak and massage your feet. Some foot spas use motorized foot rollers, while others use manual rollers to provide a relaxing massage. Foot spas are great because they can maintain the water’s temperature, and some of them can even warm up the water when you want to. Most of these units are compatible with bath salts and massage oils, and using these products will only enhance your massage experience. A great thing about foot spas is that they use different accessories to massage and scrub your feet. This will improve your blood circulation and it will make your skin look better. All said foot spas are great products. They are ideal for people who want to soak their feet after a long day. 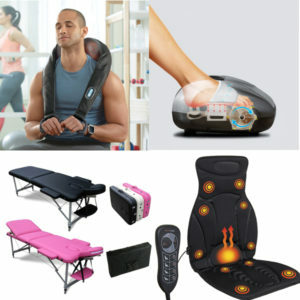 Foot massagers should be the go-to products for everyone who wants to either relax or stimulate their foot muscles. 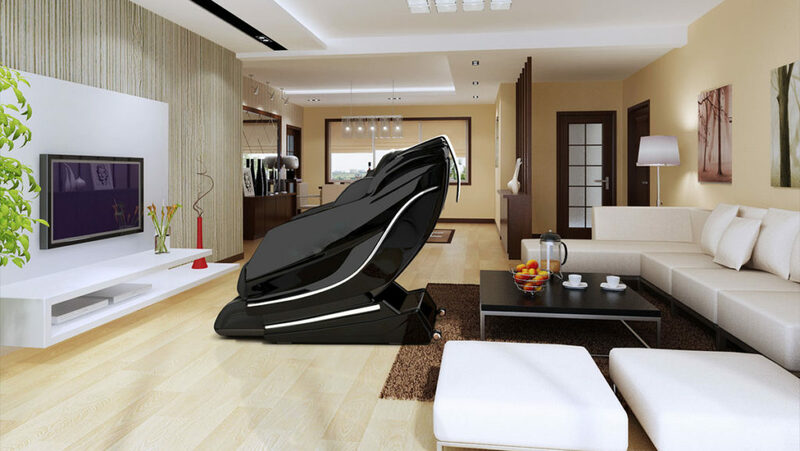 These units use different massage techniques to massage your feet, and most of them come with different intensity settings, so you can customize your massage sessions. One of the advantages of using foot massagers is that they’re great at improving your blood circulation. Whether they use an oscillating, a vibrating, or a kneading massage technique, all of these units are specially designed to stimulate your feet and leg muscles and to improve your circulation. Another advantage of using these models is that they can also provide a relaxing massage experience. You can select the intensity of most models, so you will be able to customize your massage experiences. Overall, foot massagers are great for people who want a royal treatment for their feet. 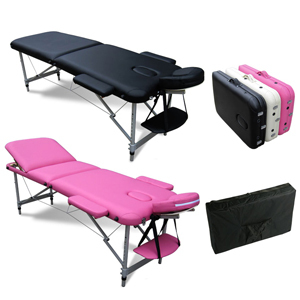 Portable massage tables are great products for both professional and amateur masseurs and masseuses. These products are portable, so they will allow you to go to your customers’ homes or offices, so you will be able to accept more clients. One of the advantages of using portable massage tables is that they’re comfortable. Despite the fact that most of them are lightweight, they still have thickly padded decks that will keep your clients comfortable and steady during the massage session. Most portable massage tables are easy to set up and fold, and once you get the hang of the process, you’ll be able to do it in a couple of minutes. And once they’re set up, these tables are steady. Whether they’re made out of aluminum or wood, the tables use steel support cables to maintain their stability during the massage. The bottom line is, using these massage tables will make you look like a professional, and they might improve your clientele. Also, check out our roundups of the best back massagers here!